Houghton Mifflin Harcourt, 9781328974693, 256pp. We humans like to think of ourselves as highly evolved creatures. But if we are supposedly evolution’s greatest creation, why do we have such bad knees? Why do we catch head colds so often—two hundred times more often than a dog does? How come our wrists have so many useless bones? Why is the vast majority of our genetic code pointless? And are we really supposed to swallow and breathe through the same narrow tube? Surely there’s been some kind of mistake. As professor of biology Nathan H. Lents explains in Human Errors, our evolutionary history is nothing if not a litany of mistakes, each more entertaining and enlightening than the last. The human body is one big pile of compromises. But that is also a testament to our greatness: as Lents shows, humans have so many design flaws precisely because we are very, very good at getting around them. A rollicking, deeply informative tour of humans’ four billion year long evolutionary saga, Human Errors both celebrates our imperfections and offers an unconventional accounting of the cost of our success. "A funny, fascinating catalog of our collective shortcomings that’s tough to put down." "An entertaining and enlightening guide to human imperfections." "The author's offbeat view of human evolution makes for lively reading and invites readers to think deeply." "Nobody will see their body in the same way again." "In Human Errors, Nathan Lents explores our biological imperfections with style, wit, and life-affirming insight. You'll finish it with new appreciation for those human failings that, in so many surprising ways, helped shape our remarkable species." "A fantastic voyage through the human body"
"Anybody with a slipped disk knows humans are not very intelligently designed, but most of us are unaware of the extent of our imperfections. 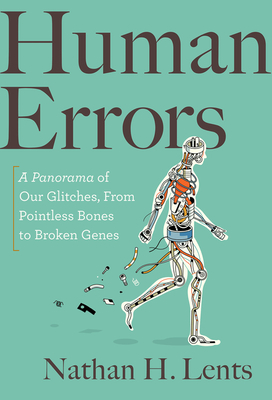 Nathan Lents fills in the gaps in Human Errors, an insightful and entertaining romp through the myriad ways in which the human body falls short of an engineering ideal—and the often surprising reasons why." “Anyone who has aged without perfect grace can attest to the laundry list of imperfections so thoroughly and engagingly considered by Nathan Lents in Human Errors. This is the best book I’ve read on how poorly designed our bodies are. I learned something new on every page." “Human Errors is outstanding, scholarly yet entertaining. Perhaps inadvertently, this funny book argues that if there is an intelligent designer, he is comically hopeless."